"Save the cheerleader, save the world" are the defining words of Heroes, the phenomenal series that has transformed television drama. They are also the cryptic marching orders for the show's cross section of ordinary individuals united by an extraordinary bond. Each possesses a superhuman ability, and together they must prevent the course of history from taking a terrifying turn. Now, in this original novel based on the TV phenomenon, in a thrilling story that will captivate even those who haven't seen the show, one of these unexpected saviors steps center stage on a deeply personal quest that will test the limits of his gift, the depth of his love, and the ultimate strength of his will. Hiro Nakamura possesses the remarkable power to control time. And like his uniquely blessed comrades, he's on a mission for the good of humankind. But another challenge awaits him: saving the love of his life from an unspeakable death. Charlene "Charlie" Andrews is the big-hearted, small-town beauty whose sunny smile and sweet soul knocked the shy Hiro head over heels. But when Charlie's young life is snuffed out by a grisly serial killer, their budding romance is brutally cut short. Or is it? 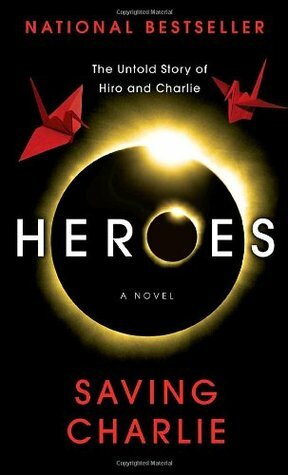 Thanks to his astounding newfound skill, Hiro has the means to do what no tragedy-stricken lover in history ever could-turn back time. And no matter how raw his abilities, or how many twists of circumstance conspire to foil him, he vows to deliver Charlie from the evil poised to claim her. He will be her hero. Saving Charlie was difficult to rate. In the end, I've settled on three stars, simply because I'm a Heroes fan; otherwise, it would have gotten two. The premise was good: what happens between Hiro and Charlie during their six months together. However, the writing was rather juvenile, as was the characterisation, which made Hiro a whiny, love-struck teenager. The author certainly didn't make enough out of the superpowers side of things, sticking with sickly romance. The scenes that popped were the ones lifted directly from the show; the stuff in between was far less engaging. I'm glad I read it, as part of my Heroes collection, but sadly, like many TV/Film-tie-ins, this book suffers from average writing that, at times, alters the characters so much they are barely recognisable. If you are a huge fan of the series, you'll get something out of it, but it probably won't mean enough to make sense to those who haven't watch the show.